Yes, Tesco has brought back an all time favourite extra Clubcard points offer. The BT 3690 Twin cordless home phone for £45 comes with 300 extra Clubcard points. 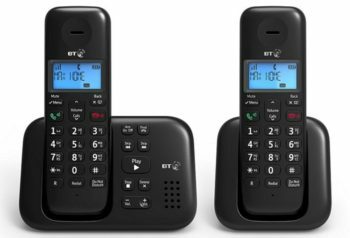 The BT 3690 Trio cordless home phone for £60 comes with 500 extra Clubcard points. It also looks like Tesco has reduced the price for both sets. About a year ago the twin was £67.50 and the trio £90 – and you got the same amount of extra Clubcard points. You can turn 300 Clubcard points into £9 of Uber credit and 500 Clubcard points can get you £15 off days out. If you are in the market for a new home telephone, and I know that many don’t use them anymore, this is quite a good offer. And to be honest I’m just happy to see Tesco running extra Clubcard points promotions again. To get the extra Clubcard points you need to receive your Tesco Grocery delivery by 20th February. Guess who’s got loads of stock they need clearing ? Just checked and both are available. you are right. i have checked now again and it shows available when i am not logged into my tesco account but then unavailable when i am logged in..